Mark Wahlberg's most significant cultural impact in 2018 came via the publication of his daily schedule, with its emphasis on gruelling workouts it was roundly mocked for a 2:30am wake-up time amongst other bizarre features. 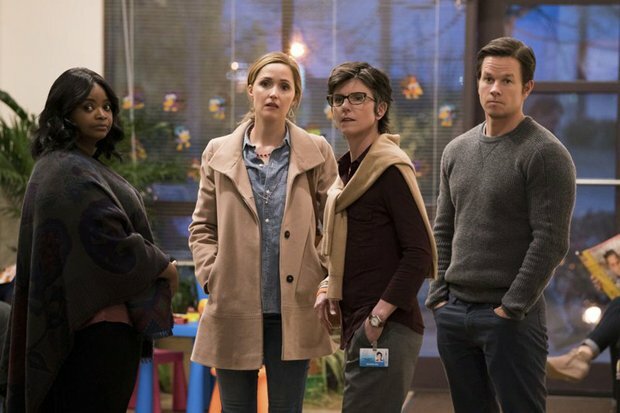 As a well-timed riposte, Instant Family is an ideal vehicle for Wahlberg's blue-collar charm, pairing him with Rose Byrne (in her Bad Neighbours co-conspirator mode) and throwing some endearing children into the mix. The result is a feel-good comedy drama that squeezes laughs and sentiment from its fostering theme. Wahlberg and Byrne play Pete and Ellie Wagner, a couple who successfully flip houses for a living, and believe they might be able to do the same for needy kids. Despite the warnings of fostering experts (nicely played by Octavia Spencer and Tig Notaro), the Wagners agree to provide a home to teenager Lizzy (Isabela Moner) and her younger siblings. But children prove somewhat trickier to manage than real estate, and Pete and Ellie struggle with the pressures of their instant family. Writer-director Sean Anders previously worked with Wahlberg on the crude Daddy's Home movies but, using his own experience of adopting a trio of siblings, creates a more sincere confection here, dialling back the slapstick and drawing on humour that feels earned. Incidents like a trip to a theme park, or an excursion to Lizzy's high school to confront a potential sexual predator are presented in cringe-worthy detail, and feel self-deprecating enough to have been lifted from real experience. And the depiction of Pete and Ellie's relationship has enough irreverent and honest undercurrents to give Anders's film a personable, likable centre. Instant Family is a snapshot of messy parenthood that works best as a cheerful public service advert for foster care. It comes complete with a manipulative but deserved finale that gives the tear-ducts a thorough workout. General release from Thu 14 Feb.